We decided to have a co-ed baby shower for a few reasons, which I’m going to talk about below! I think it’s a great option for everyone :) When deciding on the location and theme of our shower, we picked our friends parents house ( they were nice enough to let us have it there) because their backyard is super pretty with a pool and vineyard views. Sadly, a big storm decided to show up the day of our shower forcing us to be indoors. Thanks to my bffs and our moms, we moved things inside and made it equally as cute! As far as the theme goes, desert vibes was the OBVIOUS choice. I didn’t want a gender related theme or a baby related theme, I just wanted something that made sense with our style. My good friend Jess and my sister in law Jenae put together this amazing cactus balloon sculpture which I wish I could have taken home with me and kept forever haha. I knew I wanted our maternity photos in Joshua Tree from the moment we found out we were pregnant. I realized we would be there mid December for a Palm Springs wedding, so we should make it happen on that trip. I also was totally fine doing our photos while I was still on the smaller side (I wanted to have these photos and our baby shower done before I was huge and uncomfortable). For reference, I’m 26 weeks in these photos. So we met up with Carmen Santorelli the day after the wedding and did our photos. We luckily were able to bring Sawyer down with us too!! I mean, I probably wouldn’t have been able to do our maternity photos without him haha. I see a lot of bad maternity photos online that are just too cheesy, and I wanted to stay away from that. I wanted these photos to just capture this moment in our life and for us, it was just our yearly photos. In early September we had a gender reveal party at our house. I love any excuse for a party, so I wasn’t going to let this moment slip by without a celebration! We went in to find out the gender via a blood test around 9 weeks, but the only person who knew was our friend/photographer Tina. 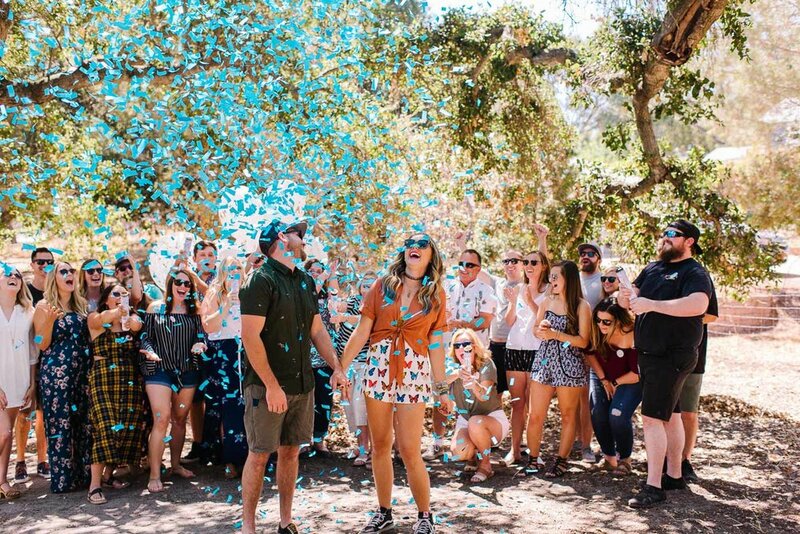 She emailed the confetti seller on Etsy, Once Upon A Party Co., with the gender and kept our secret for us for about 2 weeks! It was so fun getting to find out the gender of baby Poff with our friends and family. And in case you’re wondering, I had a strong feeling it was a boy, so I wasn’t surprised at all haha. Feb 2. 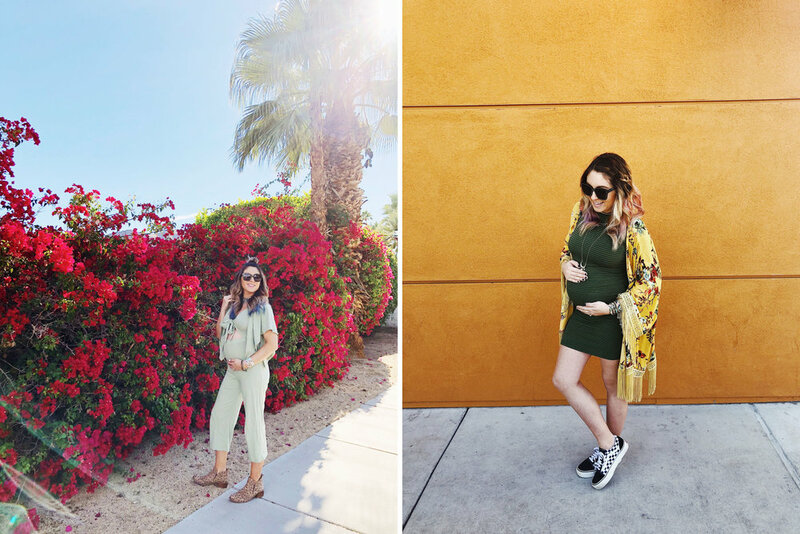 Weekend Update + Links! 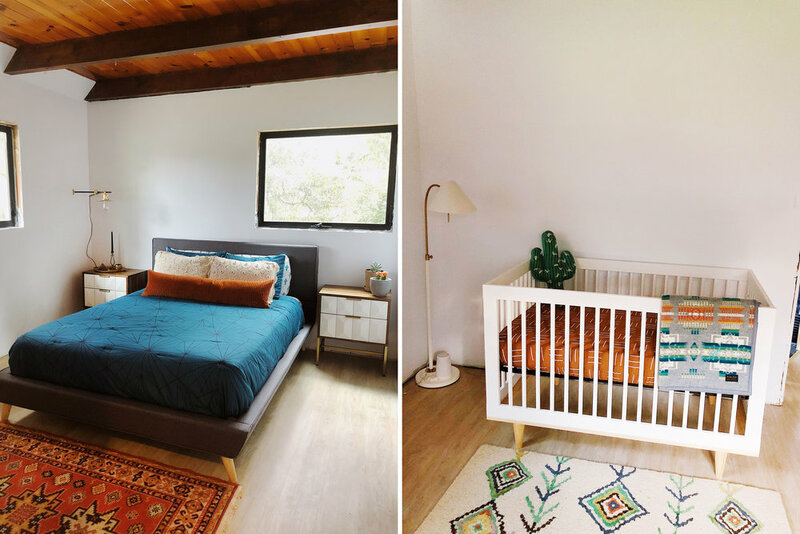 If you followed us on Instagram stories over the weekend, then you know that we put together our guest bedroom and a lot of the nursery. We had to finish laying some floors before we could bring things into the nursery, but we got it done!! We also had to clean up the guest room and get some things out of there before we could start. After that, we put together the bed frame and brought our old nightstands downstairs (if you’ve been following for a while then you know about this nightstand issue we had haha). Basically both rooms started as blank slates yesterday, so by the end of the day we felt very accomplished because the rooms look so good now! Sunday, July 8 was the day we found out we were pregnant. I had been feeling like things were slightly off with my body, so I decided to take a pregnancy test even though I hadn’t even missed my period yet. I ran downstairs that morning and 3 minutes later our lives changed forever when we saw the two pink lines. It all happened quickly and I think we were in a bit of shock how fast we got pregnant, but of course we were SO SO excited!! My first thought was that babies due date would be in March, meaning during the off season for weddings haha. From this moment on, our conversations shifted to so much talk about baby stuff and life with a baby. We were only 4 weeks along when we found out, so we had to wait 5 more weeks until our first doctors appointment and ultrasound. It felt like the longest 5 weeks ever!